Network analytics are only as valuable as your ability to collect, centralize and interpret the data. And with the growing scale and complexity of today’s network services ecosystem, unlocking your network’s hidden insights is more difficult than ever. Enter Blue Planet Analytics. 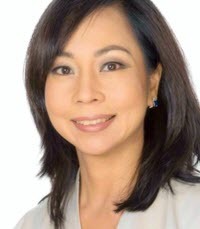 Mina Paik is Director of Portfolio Marketing at Ciena’s Blue Planet division, where she brings over 20 years of product marketing and management expertise working with some of the world’s leading companies in the telecom networking space. Most of us know that analytics is not a new concept. Analytics, which involves the “discovery, interpretation, and communication of meaningful patterns in data,” has been around for a good 20 years or so. Today, you can browse through dozens of stories on the internet about enterprise companies using analytics to drastically improve their business outcomes and improve customer loyalty. Burberry, a leader in the fashion industry, for example, uses radio frequency ID tags in their stores to create customer profiles by tracking what customers try on while shopping. The goal is to learn their customer’s behavior patterns in order to create more personalized experiences. CVS Health, a popular pharmacy and healthcare company, provides another good example. They’ve implemented what’s referred to as ‘predictive behavior routing’, where customers calling into their call centers are matched with agents who can best engage with them based on the caller’s speech patterns. This data-driven matching of customers and agents resulted in significantly improved call outcomes and reduced call times. With the growing scale and complexity of today’s network services ecosystem, unlocking your network’s hidden insights is more difficult than ever. For service providers and other network operators, the value of analytics applied to their networks is no different. As terabits of traffic data traverse their networks, trends and patterns can be detected. If accurately deciphered, they can help with optimizing various aspects of their business and operations – such as enhancing customer experiences, increasing efficiency, lowering costs, better SLA management, and improving the accuracy of business forecasts and resource requirements. But network analytics are only as valuable as your ability to collect, centralize and interpret the data. And with the growing scale and complexity of today’s network services ecosystem, unlocking your network’s hidden insights is more difficult than ever. Blue Planet has responded to this need by integrating advanced analytics capabilities as a strategic evolution and extension of our award-winning software suite – introduced today as Blue Planet Analytics (BPA). As our CEO Gary Smith points out, “It’s the technologies that enable the greatest degree of choice for customers that will win.” Real choice and flexibility enables our customers to innovate rapidly and address the challenges of network transformation by using technologies that best suit their unique business needs. Service providers and other network operators who’ve deployed Blue Planet have already gained the benefits of a truly open, vendor-agnostic solution that embraces a collaborative approach to solving their challenges. BPA was designed with this same governing philosophy in mind. 1) BPA is built on Blue Planet’s open design and extensible micro-services-based architecture, and leverages the proven Blue Planet Resource Adapter (RA) technology to collect data from any source across the network, including multiple network vendors, layers and physical or virtual domains. 2) BPA consists of two parts—a robust and flexible software framework responsible for collecting and normalizing data collected from across the network, and advanced upper-layer analytics applications designed to work with the framework in addressing specific business or operational concerns. This separation enables operators to shift their focus on business logic, rather than on infrastructure concerns. 3) The initial analytics application launched with BPA is Network Health Predictor, which provides proactive network assurance, intelligently predicting the likelihood of failures across the optical, Ethernet, and IP layers before they impact end customers. 4) BPA uses advanced machine learning innovations to provide analytics applications with the most important and relevant data. 5) By using BPA, network operators can quickly implement smart, data-driven network control through integration with actionable systems like Blue Planet Multi-Domain Service Orchestration or 3rd party systems. 6) When combined with orchestration, policy, and control, BPA enables a path towards autonomous networks of the future. Intelligent automation is becoming a fundamental requirement with the rise of IoT and the need for machine to machine communications. 7) Supporting our commitment to providing customers choice and flexibility, Ciena Services offers Analytic Services available today, including analytics ‘as-a-service’ for those who may want to utilize our world-class Specialist Services to leverage the benefits of big data analytics. This initial set of services includes Network Health, Topology Discovery and Alarm Correlation – all leveraging customer network data, machine learning, the Blue Planet Analytics framework, and data-science expertise to deliver valuable insights into network operation. Ciena Services also delivers customized applications to suit specific requirements. 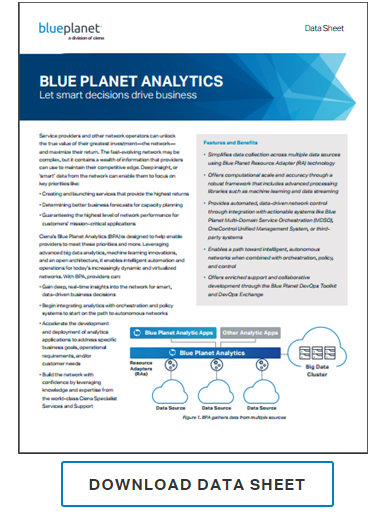 As extensions of Blue Planet’s software suite, Blue Planet Analytics and Network Health Predictor are enriched by a collaborative development environment where service providers and ecosystem partners can share resources, ideas, and know-how to help solve the toughest network transformation challenges and address customer needs. Interested in developing new analytics applications that showcase your domain expertise? Blue Planet customers and ecosystem partners are also encouraged to join the Blue Planet Community and DevOps Exchange to experience first-hand, the meaning of true openness and collaborative support towards accelerating network transformation in this digital age.